Looking for a job in Faulkner County Arkansas? The following is a directory of Faulkner County Arkansas top employers with direct links to the jobs they offer. This directory includes local city job links as well as the larger job posting boards. Faulkner County's primary cities and towns for this review are Conway, Greenbrier, and Vilonia. Only sources that have job listing pages, business directories, and/or legitimate human resources contact listings are provided below. 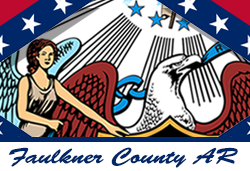 Faulkner County is adjacent to the counties of Van Buren, Cleburne, White, Lonoke, Pulaski, Perry, and Conway. Faulkner County Arkansas had job openings on this review date. Open positions had included Detention Officer, Patrol Deputy, and Dispatcher. Visit the county employment page for current listings. The City of Conway was hiring on this review date. Openings found had included Project Engineer, Transportation Engineer, Collector, CDL Driver, Telecommunicator, Part-Time Seasonal Grounds Maintenance Job, Part-Time Evening/Weekend Facility Monitor, and Part-Time Deputy Clerk. The City of Greenbrier posts open positions when vacancies exist. The City of Vilonia postes employment opportunities when openings become available. During review there had been listings for Parks & Recreation Field Work and Parks & Recreation Umpire. Note: Some of the largest employers include the Conway Regional Health Center and Conway School District. These employers are listed under education and healthcare categories that are displayed lower on this page. Conway Regional Health System provides complete health care services to the growing communities of northern central Arkansas including Faulkner, Conway, Perry, Van Buren and Cleburne counties. A sample of open positions found had included Registered Nurse RN, Cath Lab Nursing Jobs, Rehab RN Jobs, Cardiac Telemetry/MedSurg RN, Advanced Practice Nurse, Care Coordinator, Central Sterile Technician, Pediatric Nursing Jobs, Clinic Medical Assistant, Clinical Applications Analyst, Environmental Services Tech I, House Supervisor, Licensed Practical Nurse LPN, Nutritional Services Aide, Patient Access Representative, Patient Care Tech, Registered Nurse Med Surg, Physician, Hospitalist, Registered Respiratory Therapist, Surgical Technologist, WEO RN, and more. AR Care was advertising multiple positions during this review. Openings had included Licensed Clinical Social Worker, Medical Secretary, Medical Assistant, LPN Clinic Nurse, Clinic Nurse, Insurance Representative, Facility Assistant, and more. Pediatrics Plus provides specialized pediatric healthcare. Listings found had included Classroom Teaching Assistant, Substitute Nurse, Board Certified Behavioral Analyst (BCBA), Occupational Therapist, Physical Therapist, Registered Behavior Technicians/Behavior Technician, and Speech Therapist. Conway Human Development Center uses the State of Arkansas job board. Conway School District periodically hires teachers and support staff. Check for listings. Greenbrier School District was hiring for the position of Substitute Bus Driver on this review date. Other positions are advertised as vacancies become available. Guy-Perkins School District provides certified and classified employment applications. Many disctricts only list their jobs on Arkansas Education Jobs site. Conway Christian School enrolls approximately 500 students, preschool through 12th grade. Periodically employment opportunities are listed on their website. The University of Central Arkansas enrolls more than 11,000 students. Numerous ongoing employment opportunities exist for teaching positions and support staff. Hendrix College was hiring administrative staff, facilities maintenance positions, and faculty. Arkansas State Jobs lists openings for department such as Arkansas Department of Health, Arkansas Department of Human Services, and Department of Correction. Arkansas Government Jobs is hosted by the Information Network of Arkansas in conjunction with the Department of Finance and Administration Office of Personnel Management. The Craigslist for Conway had listings for Swim Coach, Groundskeeper, Field Interviewer, Administrative Assistant, Full-time Receptionist, Carpenter, Truck Driver, Mechanic, Mover, and more.